Representing injured workers nationwide under the Longshore and Harbor Workers’ Compensation Act (LHWCA), Defense Base Act (DBA), and Non-Appropriated Fund (NAF) employees since 1982. Mr. Birnbaum is a specialist certified by the California State Bar in Workers’ Compensation as well as Admiralty and Maritime Law. The Law Office of Steven M. Birnbaum has attained the highest AV rating by national lawyer’s rating organization Martindale-Hubbell. Mr. Birnbaum is a board member and the past president of the Workers’ Injury Law and Advocacy Group (WILG). 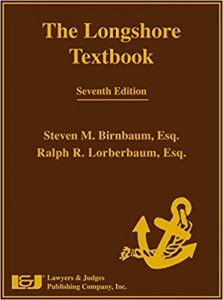 Mr. Birnbaum is the co-editor of the 7th Edition of the Longshore Textbook published by the Lawyers and Judges Publishing Company. Workers injured while working in longshore, ship repair and ship building have federal workers’ compensation claims under the Longshore & Harbor Workers’ Compensation Act (LHWCA). Independent contractors injured while working on overseas government contracts have federal workers’ compensation claims under the Defense Base Act (DBA) and the War Hazards Act. Non-government employees injured while working on military bases may be entitled to workers’ compensation claims under the Non-Appropriated Funds Instrumentalities Act (NAFI). What benefits can an injured worker be entitled to? What kinds of legal problems can the Law Office of Steven M. Birnbaum help with? What is a cumulative trauma claim? The Longshore and Harbor Workers’ Compensation Act covers you for pain and other sympoms you feel as a result of gradual wearing out of joints and orther organs. If you are experiencing pain, that pain may need treatment and may even entitle you to payments under workers compensation. If you have numbness in your hands, tingling and feelings of cold, CALL US, we may be able to help. It might be a sore knee that never goes away or the sore shoulder, neck or back that is stiff every morning when you get up or before you start work, or when a specific body part begins to hurt after a long, hard day of work. It also could be exposure to toxic substances or breathing bad air or dust in the workplace. If you have any questions as to whether you might have a cumulative trauma claim, please contact the Law Office of Steven M. Birnbaum and ASK. You may be missing out on benefits and permanent disability payments if you do not make a claim for hearing loss. Exposure to loud noise in the workplace through time may actually have damaged your hearing. If you have suffered such a loss you are entitled to worker’s compensation benefits. Contact the Law Office of Steven M. Birnbaum NOW for information on how to protect your rights. Attended New York University, New York, NY. Advisor, Benefits Review Board Report Lexis Nexis pub. Andy, Steve’s son has worked in the office on and off since 2003, most recently re-joining the firm in February of 2014 after spending four years as a legal assistant and office manager with Bracamontes & Vlasak, PC assisting with plaintiff’s side civil litigation throughout the SF Bay Area. Andy was admitted to practice law by the State Bar of California as well as the Northern District of California in February of 2019. Ms. Richter’s passion for helping injured workers began after she was severely injured in an automobile accident in 1981. Mr. Briggs joined the Law Office of Steven M. Birnbaum in early 2017. Mr. Briggs has been working as a legal assistant for two years, previously working at Charles Aaron Silverman P.C. in Chicago, IL, and is currently in the process of getting his paralegal certificate. Ms. Mateo joined the Law Office of Steven M. Birnbaum in March 2018. Ms. Mateo obtained her B.A. in Criminal Justice in 2017, and is currently attending Merrit College to obtain her paralegal certificate and an AA in Paralegal Studies.